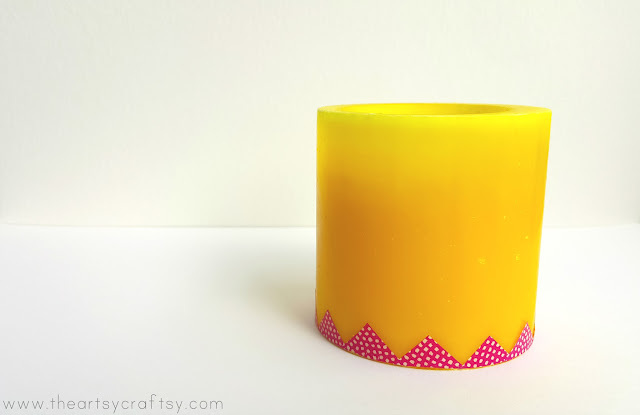 Washi tape colours are vibrant, with patterns that are fun to work with. For some of you who might be new to this, washi tapes are colourful fancy-looking tapes that come in different patterns, sizes and colours. 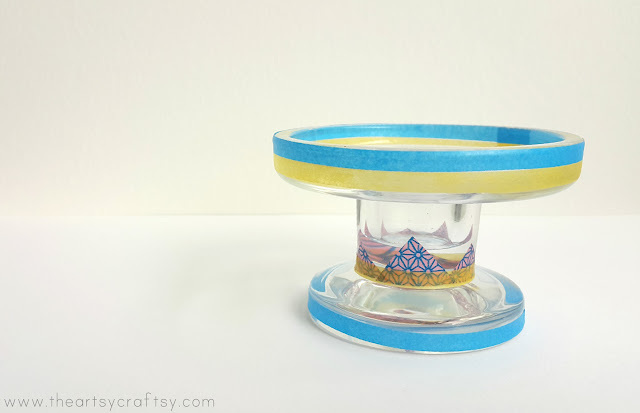 Most of it are see-through so it gives you the freedom to play with it on different craft projects. Some come in gorgeous patterns where you can match it with beautiful flat coloured tapes. Some of the famous brands that I've come to learned about are the ones like MT tapes. There are several brands out there in the market, and each of it has its own uniqueness. The better quality ones don't come off easily and sticks nicely, so make sure you look out for that. Washi tapes vary from thick to thin ones, and from big to small; as small as the one that comes with wooden spools (above). Adorable and easy to work with! If you enjoy journalling, you can definitely bring these along. The best part about washi tapes? 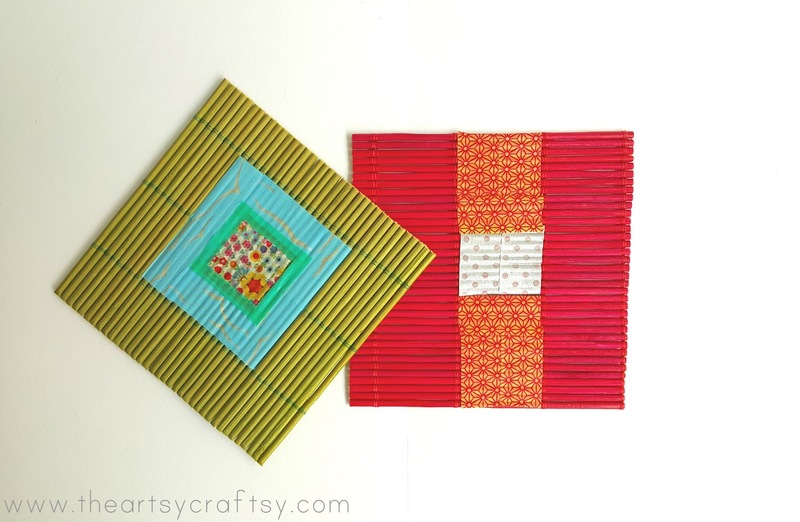 Well, you can use washi tapes for almost everything and anything except fabric. 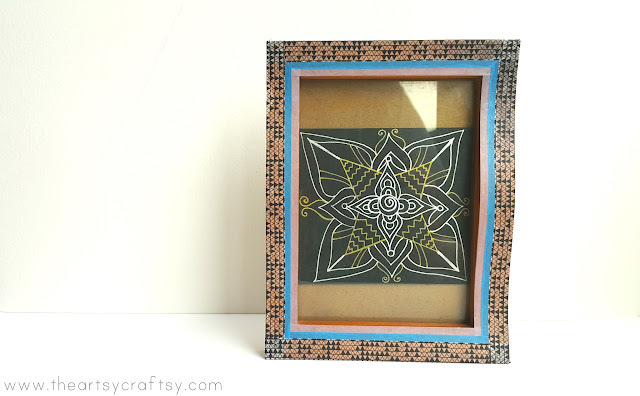 I have used washi tapes on wood, ceramic, walls, glass and of course paper. AND if you are a crafty parent who enjoys doing arts & craft activities with your kids, there are washi tapes with attractive designs suitable for children. 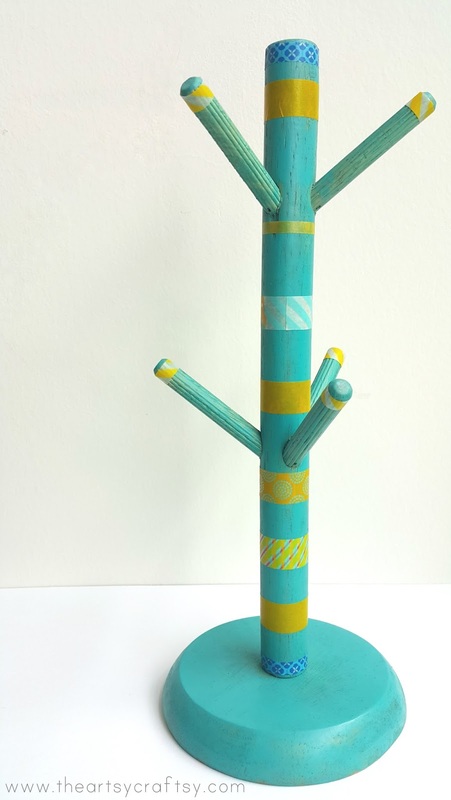 I decided to be a little adventurous and started a project; I came up with 15 ways to use washi tapes on anything that I can use it on in my little studio. So, I started gathering things to revamp with washi tapes, and add colours to our space. Not long ago, I purchased a wooden cup hanger from a vintage thrift sale. I had plans to repaint it and use it as my craft booth prop when I participate at art markets. I wanted to use it to hang handmade accessories for sale. I finally did it; repainted it with turquoise acrylic paint and tape it with matching washi tapes. 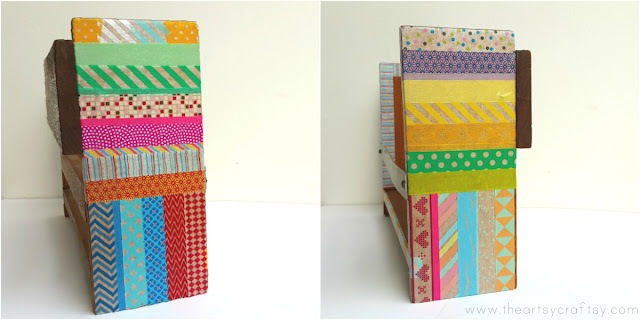 A very easy method; I learned that when it comes to washi tapes, it is not just about taping; it is about the right colour combination as well. This photo frame was given by a friend, she had it lying around and wasn't sure what to do with it. I decided to redecorate it so that I can frame up one of my drawings. Among the 15 crafts I have made, this is one of my favourites. I bought these wooden alphabets when I first moved in to the studio. I was elated with joy that I finally had my own place, and got myself some wooden alphabets to form the word 'Home'. I wasn't sure if I wanted to paint it over, because I like it plain sometimes; but after a year later, I am finally inspired to decorate it! This proves, good things come to those who wait, haha! Fancy a cup of tea with some nice washi tape patterns? I love how I can tape on almost everything with washi tapes. 7. 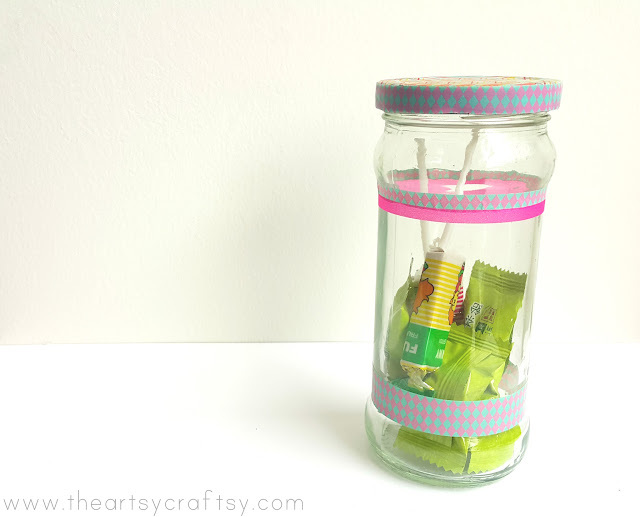 Quick Party Favours or Trinkets! Those who know me well, would know that I have a fascination for miniatures and miniature bottles. 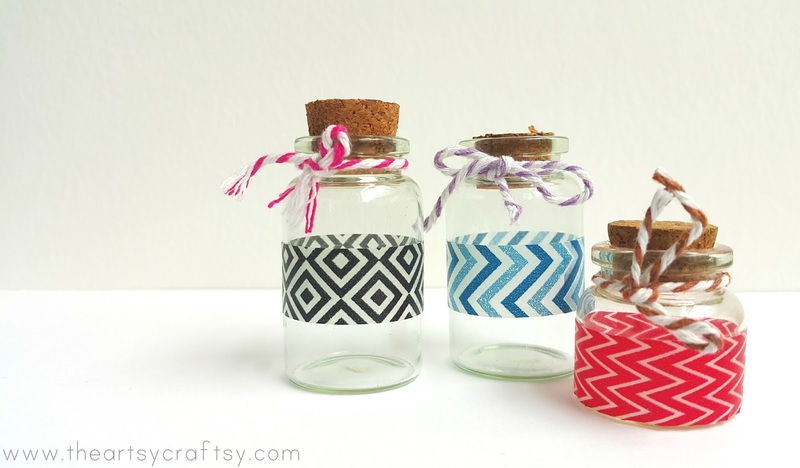 These miniature bottles decorated with funky washi tape patterns and colourful baker twines make good trinkets for party favours and little gifts. 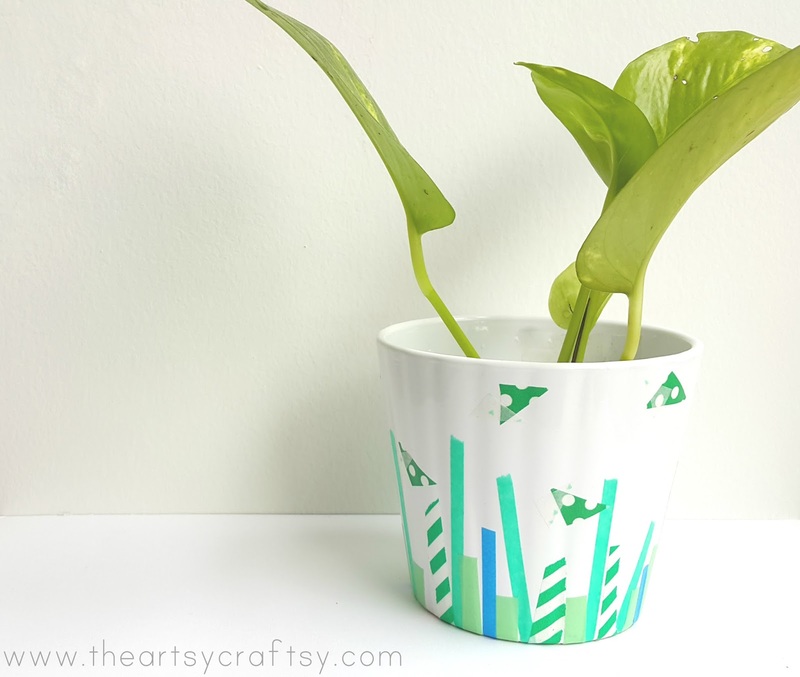 Flower pots don't have to be plain and boring anymore. 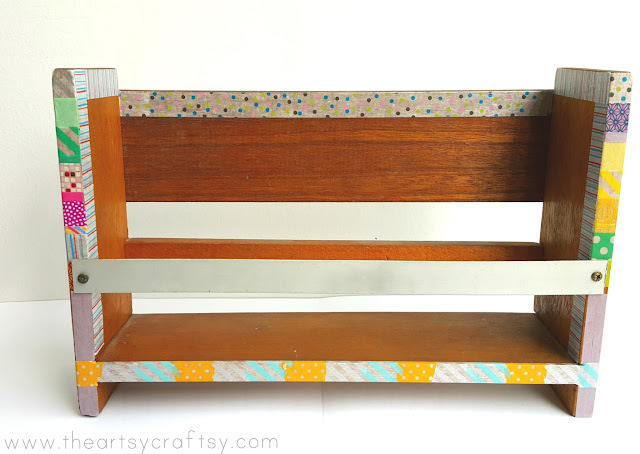 You can decorate it with different washi tape colours and patterns. Guess what? 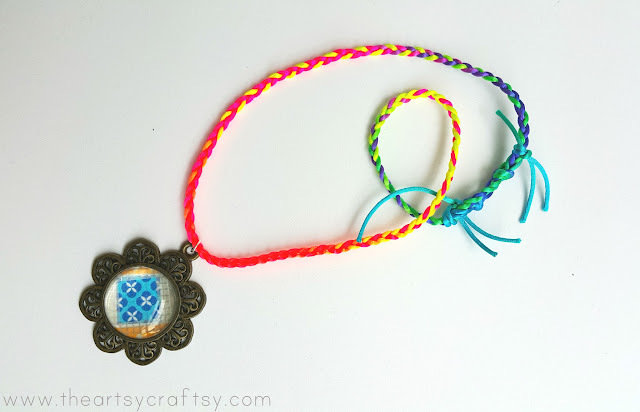 I found a way to make my own accessory with washi tape! Great for quick fashion statement necklace. 11. 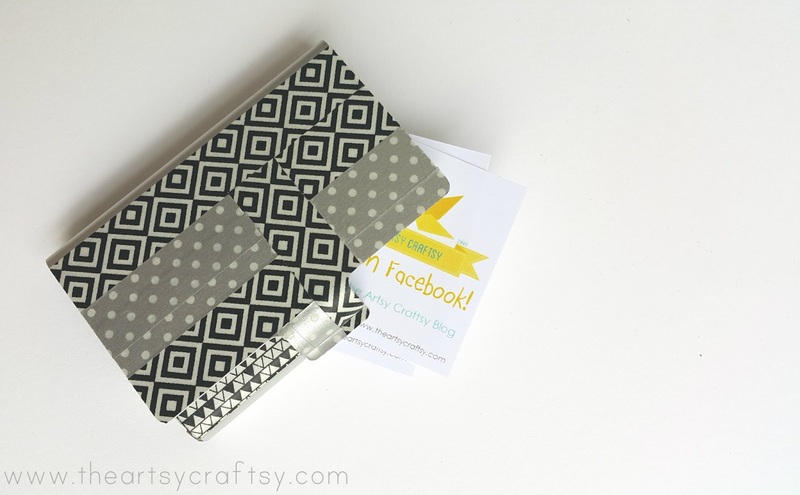 Turn an Old Notebook into New! 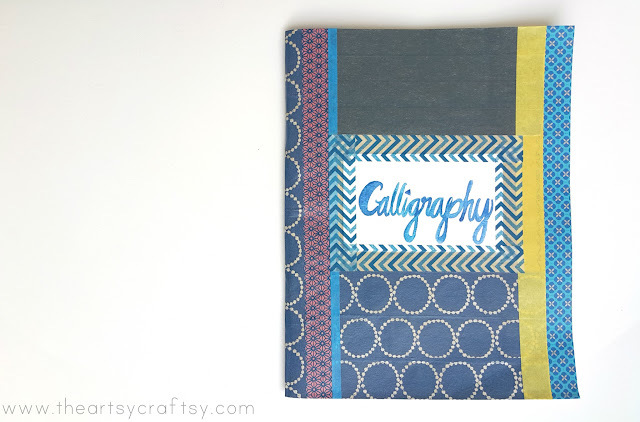 I discovered that I can even make my own notebook with a washi tape! I decided to use one of the school exercise books (belonged to my other half's younger brother), to make my own notebook for practicing calligraphy. I turned an old notebook into a new one by taping the entire book with washi tape, using the slightly bigger width ones for most of it. I also made my own signage. A quick and easy solution, great for events too! All you need is a thick white paper, your name card, stamps and washi tapes. This one has sentimental value. I made this multipurpose holder when I was in high school, that means this is more than 10 years old at least. It was so hard for me to part ways with it, because clearly, I did an amazing job. I was searching for something 'big' that I can tape, and thought it was a good idea to give it a new look! 15. Mini Fancy Polaroid Photo Frame! The final 15th! 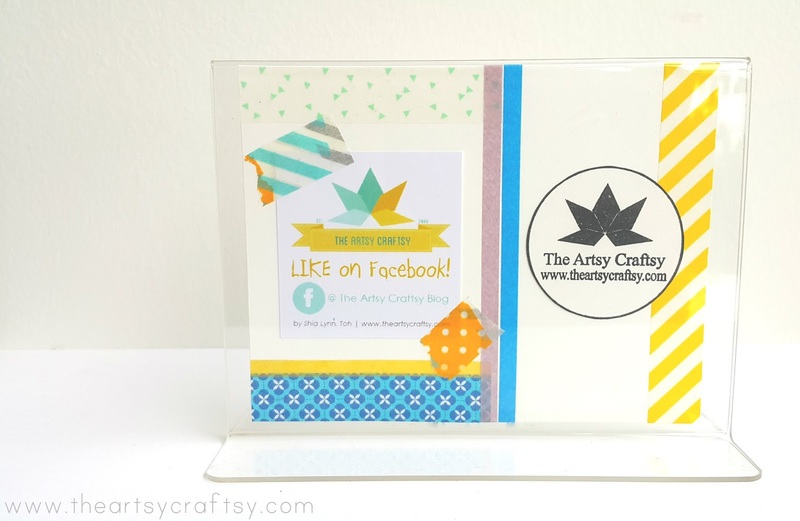 It's very easy to make a polaroid photo frame; all you need is a thick white paper, cut it to the size and shape of a polaroid, then tape it with a washi tape. You can have it in any design you want, I just happened to like this one! After this, I will be sticking this into my journal, perhaps over a picture or some special quote. 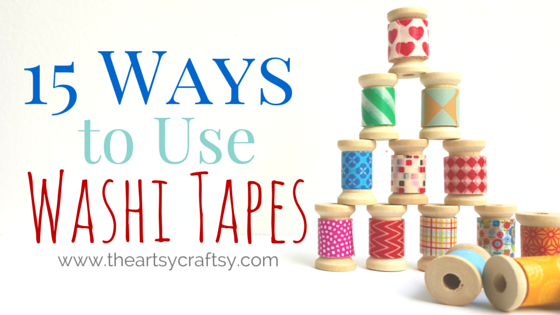 Have fun exploring the many ways to use washi tapes! very creative of you Shia! keep up the good work! One of the fabric bag makers in malaysia use washi tape on her name card too. Can't remember which one already but I've seen her in publika market :) Brilliant idea! Very creative way of using washi tape! Now you are tempting me to buy lol!